In the never ending stream of collabs the turn has come to Burton and Kid Robot. Kid Robot is now a days best known for different collabs (again) with all over prints – mostly on hoodies. Back in the days Kid Robot was probably the best place on the Internet to get your vinyls and assorted toys. Ningyoushi and Giant Robot have always been god but not as good as Kid Robot. Anyway, now the first Kid Robot snowboard is here. The board is the classic Custom in size 158. A good but perhaps a bit boring choice. The way we see it a better choice for a Kid Robot board might be the Jussi or mayeb the Se7en. Or even Malolo. Burton and Kid Robor also gives us some pretty crazy and really expensive jackets and pants. 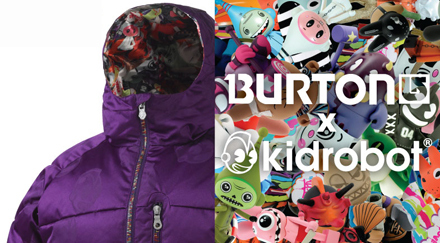 You´ll find all the stuff at Kid Robot and the Burton flagship stores. future is giving away a kid robot set up in their new issue. Welcome to KiNK.se and we hope you enjoy your visit. It's updated by us, Fredrik and Johan, two ordinary guys from sweden. This page contains articles about actionsports and stuff related to it. Do you have anything to tell us? Contact us!